Sustainability Challenges in the Agrofood Sector covers a wide range of agrofood-related concerns, including urban and rural agriculture and livelihoods, water-energy management, food and environmental policies, diet and human health. Significant and relevant research topics highlighting the most recent updates will be covered, with contributions from leading experts currently based in academia, government bodies and NGOs (see list of contributors below). 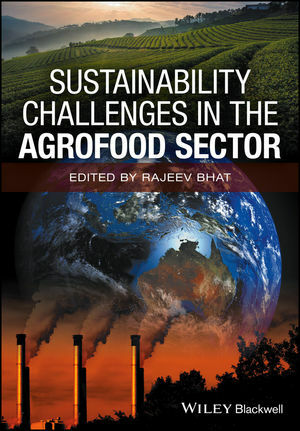 Chapters will address the realities of sustainable agrofood, the issues and challenges at stake, and will propose and discuss novel approaches to these issues. This book will be the most up-to-date and complete work yet published on the topic, with new and hot topics covered as well as the core aspects and challenges of agrofood sustainability. Dr Rajeev Bhat is currently working as Associate Professor and Head of Food Science Department at the Fiji National University, Fiji Islands. Dr Bhat has nearly 17 years of research experience, gained by working in India, South Korea, Malaysia and Germany. His major theme of research revolves around food security, food safety and sustainable food production. Ghose Bishwajit, Sharmistha Ghosh and Jose Renato Peneluppi, Jr.